Despite some concerns among fans when Mega Man 11 didn't do extremely well in the Japanese physical market and failed to rank among the Top 30 Nintendo Switch eShop best sellers in Japan, it appears Mega Man 11 has indeed met Capcom's expectations. That's really good news. In light of this news I think we can look forward to a bright future for the franchise. And the next Mega Man game could be already in pre-production! If Capcom is actually planning on managing the franchise well from here on out, maybe they can build it into a more substantial series again. I'll admit, I was sceptical. How about one of those collective sighs of relief? I sure could go for one right now. Not until I have enough reason to believe that we won't have to wait another decade or so to get another decent Mega Man game of any kind. See? Thats why you wait for data. Here's the thing, Capcom has to talk up games to show off to investors. What is strong sales exactly or what does performing well look like in relation? What is the number they wanted and what did they get? Didn't Capcom lowball REVII so much it messed up their stock because they had no faith in it at first, then way after the quarter of when it was suppose to perform it finally matched that lowball number to which Capcom upped that lowball number and couldn't reach half of that revised estimate? ANyway I didn't know Capcom still distributed Rockstar games. They won't lie or hide info to their investors, in the past they didn't have any problem saying some of their titles underperformed. REVII didn't hit the numbers the projected for it the first quarter it came out, and significantly fell short of the projections they set for it the second quarter. Is that what you mean? I'm a little confused by the wording of your comment. But before Monster Hunter World came out, almost literally all of their games were failing to hit their goals. So I think for Mega Man to have "strong sales" is a good sign at least relative to their other games. @Anon: Dude, stop. As a person who was doubtful all the way up to this point, I think I can justifiedly say that now you're just grasping at straws to arrive at the conclusion you want. 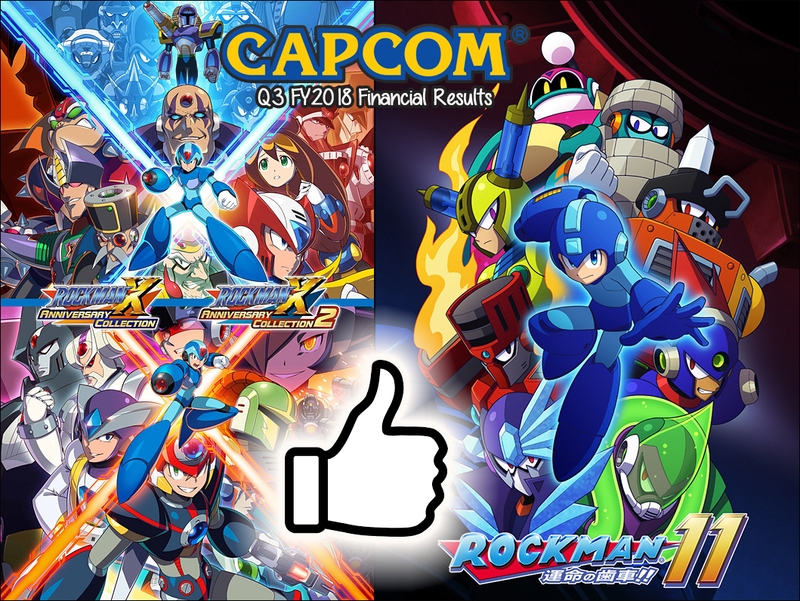 They're reporting highest profit levels in the company's ENTIRE HISTORY, thanks to MH:W. What reason do they even have to "talk up" Mega Man 11, a small-scale project with a very low budget and risk factor? Its underperformance wouldn't mean a thing next to the huge-scale success of its AAA peer. I think it's time to get over the pessimism. "Its under performance wouldn't mean a thing next to the huge-scale success of its AAA peer." Well not to the AAA game or Capcom but I think it does mean something for Mega Man. I think I see where the opening comment is coming from, I am curious about the actual numbers too outside of vague statements, especially since it is based on hard to track data like digital sells. Great news! I hope that Capcom goes a more quality over quantity approach to new Mega Man games, as looking back they cranked those babies out a couple a year. They could make the games longer with a second fortress or something or find a way to have more bonus content, as time trials don't feel like best they could do for a modern video game. Mega Man 11 was good but kind of short. I hope whatever comes next is longer. Bump up those numbers by releasing DLCs! Really what are they waiting for? I'd prefer they waited and made DLC for a Mega Man game that isn't best described as, "Yeah....that happened." Exactly. Proto Man and Bass are an absolute must. They never should have been left out of Mega Man 11 to begin with, but now that the game has sold as well as it has, there's no excuse for them to not go through with adding them. Especially since the former was already mentioned in the Sniper Joes' gallery profile. I hope this means we will get a Megaman X9 someday. Good news. Also glad that MH World did well. Capcom have been trying to pull out a success with one big AAA game for a while. i just wish whoever is in charge of Capcom in Europe did a better job advertising their brands. The people here who did play Megaman enjoy it, but lot of peoples just did'nt even know about it because it is not given a lot of exposure. Yes! Let's just hope that X9 or Legends 3 is next. If they go for a full 3d game, they will probably make legends 3 istself to begin with. Side-scrolling action plateformer is a staple of the classic serie.